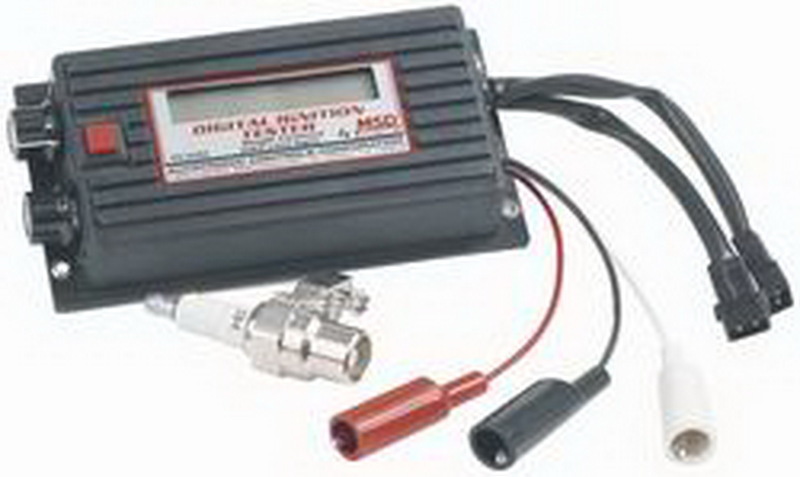 This tester will check the operation of all of MSD’s single channel CD ignition controls. Once the ignition tests good, you can continue troubleshooting and find the culprit. The tester produces a simulated trigger signal that fires the ignition just as if the engine was running. A special, load-producing clip-on spark plug is included to connect to the coil wire. If the spark is unable to jump the gap of the tester, there is an ignition problem and you can track it down. For racers with our digital programmable 7 ignition controls that are using a non magnetic pickup as sync signal for individual cylinder management, the tester has a circuit to check its operation too. The tester has an LCD display that clearly shows the simulated RPM. This also allows you to test the accuracy of any RPM limits, RPM activated switches, shift light operation and your tachometer. The tester operates on 4, 6 or 8 cylinder engines and will simulate up to 16000 RPM.